Harper Adams AD leak. Farmers Weekly photo. Feb 2013 Harper Adams AD. The major incident at the 2011 flagship AD facility at leading agricultural university Harper Adams, Shropshire, demonstrates that accidents happen – could this happen at Twemlow if the proposed AD plant was approved. Finally sealed after 36 hours, the sludge flooded farmland and entered nearby rivers as the surrounding bund failed. The EA put hydrogen peroxide into the river to help wildlife survive. The cause is being looked into. and they say it won’t smell ?????? This from Biffa’s flagship AD plant, a 24 million pound site at The Poplars, Cannock, Staffs, fighting odours for 2 years: affecting residents living well over 800 metres away. You tube video. Are the existing Twemlow tanks suitable? Families are kicking up a stink over bad smells coming from the Cannock AD site, claiming that they have to keep their windows and doors shut. 27th Sept 2013: and it’s not just smells from the plant that residents have to put up with – the EA received 70 complaints after digestate was spread over nearby fields. It seems that once an AD plant is built if it is causing problems then local residents have very little power in protecting where they live. Rothwell, Northamptonshire, 30,000 tonnes. County councillor said the plant should close if the smells were not stopped, residents say ‘the smell from this place has been horrendous’…’which the council promised would not be noticeable’. HL Foods in Lincolnshire were fined £140,000 by the EA for smells affecting the surrounding area, “a dead rat type smell”. Residents living near a Plymouth AD plant reported “repugnant” smells. “There will always be a level of odour” say the operators. A ‘foul stench’ with numerous complaints from Shanks’ Cumbernauld plant which still occurred even after new biofilter monitoring system was installed. One of the largest in Norway, Hera Vekst,’ since its start up residents have complained of odors generated by the facility’s activities’. Farington, Lancashire; “Before it was first built, there were three things they told us – it won’t be an eyesore, your property won’t be affected, and it won’t smell. “Categorically all of them have been affected in a big way,” a resident near Farington AD facility. Applied to raise exhaust stacks from 39′ to 82′ to ‘disperse the air better’. An admission that they cant stop the smell? Environmental Health Dept stepped in to ban digestate spreading Apr2014 in Cannock due to complaints of foul odours. Oh dear. 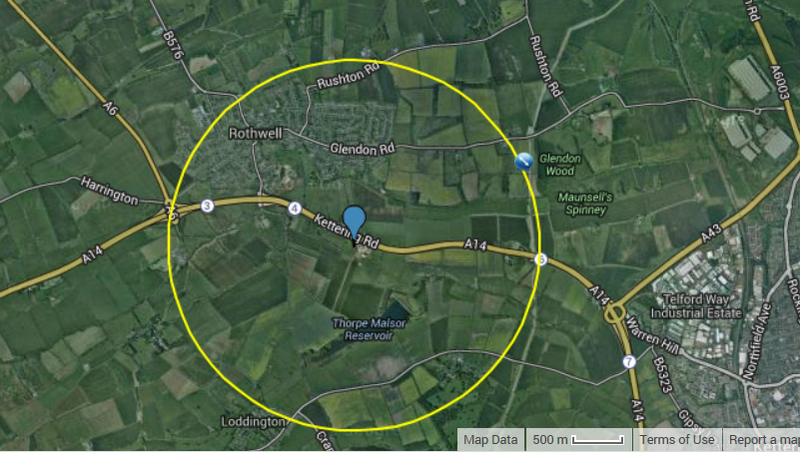 But someone suggested we look at SSE Barkip, Ayr as an example of a successful AD plant – so we’ve ‘googled’ it, but unless we are very much mistaken there aren’t 35 homes immediately around it , unlike the proposal for Twemlow – infact it is about 3km outside Beith. Clearly a better location. 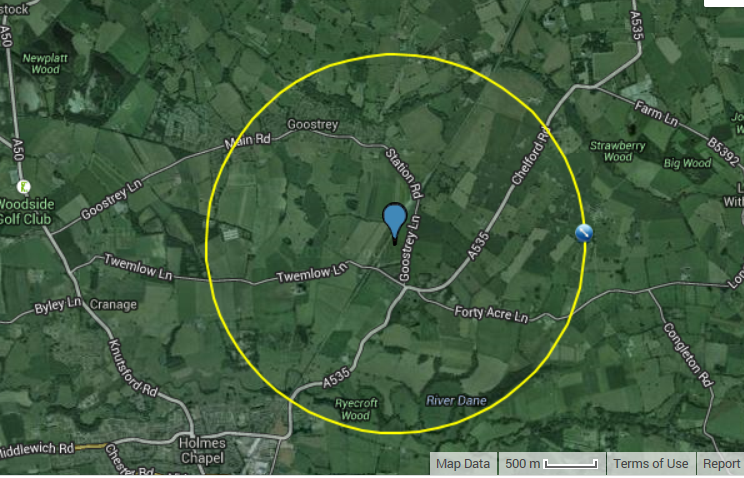 Most of Goostrey is inside a 1.7km radius. Case study: Biffa’s Poplars AD plant, Cannock. Residents living near the Biffa AD site say their lives are being made a misery. Families on the Newlands Park estate in Heath Hayes said they have been experiencing the “horrendous” smells for months and are embarrassed to invite visitors. Bosses at the site said they are aware of the complaints after launching a new facility for food waste last year. Anne Willis, a 42 year-old office worker who lives in Nuthatch Close, said: “Every few days we get the most horrendous smell. 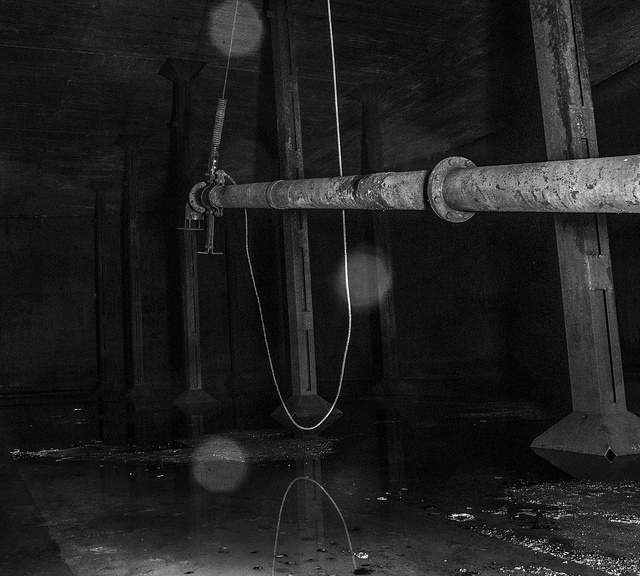 It smells like raw sewage, it is absolutely disgusting. Biffa’s anaerobic digestion facility at Cannock processes up to 120,000 tons of food waste from homes and businesses every year. They say they are working with the Environment Agency and implementing strict door opening policies, daily checks of potential odour sources and neutralising units to minimise odour escaping. October 2012 update: What’s happened so far to this 24 million pound plant? Biffa are having to make major changes to the biofilter and air extraction. “Biffa has confirmed that it is committed to the long term future of this plant and compliance with the Environmental Permit. 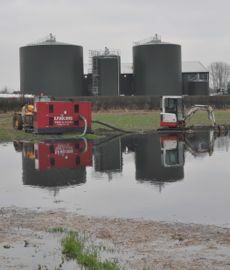 Biffa has assured us (the EA) it is employing all its resources to solve odour issues at this site. Odour from the plant has continued to cause concern for local residents. December 19th 2012: response from our MP, Fiona Bruce: “In view of your concerns, I arranged to discuss the matter with Mr Burley (Cannock MP) and he told me that investigations appear to indicate that the plant was not run according to requisite standards and regulations. This is now being looked into….” Though I think we had already gathered it was not being run properly otherwise it wouldnt have been causing atrocious smells for the past 18 months. Yet everything was delivered indoors with a negative pressure extractor using bio-filters (Cres said that bio-filters and negative pressure meant the Twemlow proposal wouldn’t smell). “Living in Cannock for six years we had an AD PLANT built 800 meters from my property 18 months ago. We were not consulted of possible affects on our day to day lives and the surrounding area . The AD PLANT GIVES OFF A STOMACH RENCHING SMELL. This meant the whole of summer 2012 we could not open , windows sit in our gardens and go on with our day to day lives. We have had various meetings with Biffa the company who run the plant and they have made vast changes but we are still getting the smell to date. Im calling Enviromental Agency about 4 times a week and this has been for 18 months . Sorry to hear that they are thinking of putting one of these disgusting plants in your area. The theory of the plant is very good with waste being used for energy but where they actually put it is a problem . Can i say to you please please make your case with councils ,press , local residents before this goes ahead, our lives have been made a hell and its only councils which make vast amount of money from this . Feb 1st 2013 update: from the Environment Agency, “Biffa has appointed a company called MWH to undertake an independent review of the plant and make recommendations for improvements to prevent odour releases. As per the requirements of our Enforcement Notice served on Biffa Waste Services Limited, a report has been produced by MWH consultants which includes recommendations for improvements to the AD plant. The majority of these improvements have been implemented this week (Dec 2012) and one further improvement is due to be completed in January. There will be a further update shortly with details of what these improvements are. Our officers will continue to liaise with both Biffa and local residents to try to resolve this matter and make sure that improvements are made to keep odour to a minimum.” We note they only say ‘try to resolve’ and ‘keep odour to a minimum‘ – of course the real problem is that it was built too close to homes and people who have to put up with the smell. Officials at the Environment Agency however say there has been a ‘significant reduction’ in the strength of the smell and that the frequency of residents’ complaints has also dropped so they are not going to close the plant down at this stage. Though they are considering what action to take over a ‘serious incident’ at the beginning of August. But a local resident says the Environment Agency’s claim that the situation was improving was unfounded. She said: “They are burying their heads in the sand, because complaints have certainly carried on. On one day alone they received over 20 calls.” Sources: Aiden Burleymp.org and the Express and Star August 2013.
good topic, this is going to help a lot of people get the whole concept. I live 80 metres from a farm ad. It stinks and the increase in traffic has destroyed our equine business. I am sorry to read your comments as we too are 140 meters from an ad plant our fields with hunter horses are a lanes width away,the smell and noise is 24/7 from the plant and lots of traffic during the day and up to 11 pm ,maybe we need to involve the rspca given what our horses are exposed too .keep fighting and chasing the ea.